Compact and convenient, the Russell Hobbs 22220 Mini Chopper food processor makes preparing food a simple task. Simply load your ingredients into the removable bowl and use the one-touch operation to chop them to size. 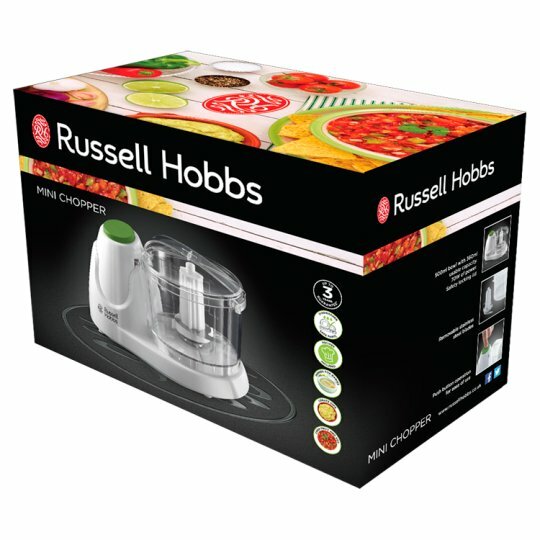 This Russell Hobbs food processor has a 340ml capacity, which is ample room to prepare small ingredients needed to make a sauce or sprinkle over a dish. This mini food processor has a 70W motor output, which provides more than enough power to chop efficiently through the modest capacity of the bowl. Use this food mixer to take the effort out of preparing ingredients such as finely chopped onions and garlic. Avoid the hassle of washing up with the dishwasher-safe removable bowl, lid and blade of this food processor. A safe-lock lid ensures no spillages occur, while the non-slip removable feet make using this mini food processor quick and safe.